I’m using Creative Zen V Plus mp3 player all this while on win xp. Yesterday, when i tried to connect my Zen V Plus from my Mac, i only realize that i don’t have any software to connect to it. So I tried to look for some help from Google and found this great piece of software that is able to let me to transfer my file from my Mac to Zen V Plus for FREE! Go here and download XNJB. 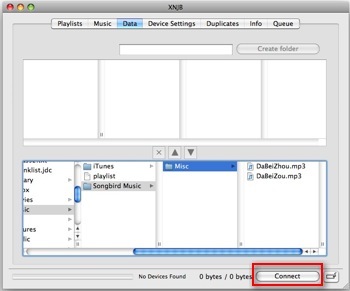 XNJB is a free software that allow Mac to connect to Creative Nomad range of mp3 player. Once connected, you will see all your files at the top area. And now you can easily transfer your files from your Mac to Creative Zen V Plus using the 3 button in the middle. Cool right? Turn on MySQL query cache to speed up query performance? How to change default mail client for Ms Excel 2007? may be there is some network problem at their end. your links didnt work. i have OS X 10.4.11 and still nada.